Mike Trout is the best player in the game, both real and fantasy. 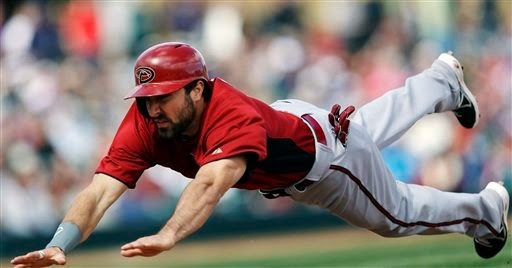 He does it all, he hits for average, has 30-homerun power, and steals bases. We can also expect the lineup around Trout to improve a bit with Albert Pujols almost certainly healthier and Josh Hamilton should be better, even if he never returns to his MVP form. 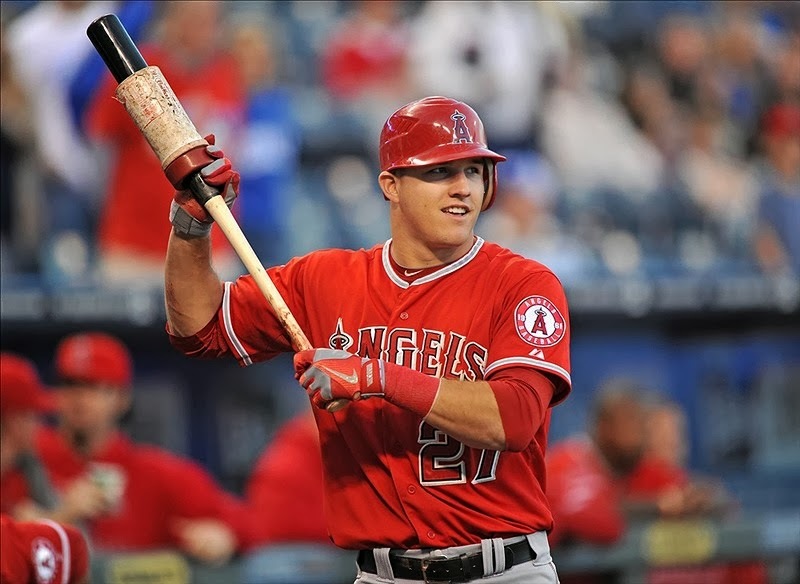 Trout is worthy of the first overall pick in leagues of all formats for which he qualifies. At just 22-years old we'll probably see him there for a while. There has been a lot of talk about his weight and training techniques but I do not believe there is anything to be concerned about here. "We were playing Sacramento -- the Yankees of our Pacific Coast League --- and we hated them, and they hated us," says Butler, who managed Eaton at Triple-A Reno last summer. "Before the game I told Adam, you haven't bunted in a while, this is going to be part of your game going forward, so you should bunt. So in his first at bat, he drags one to first, and gets on base. Second time up, he bunts it to first again, and then he does it again --- three times in a row. And now the other team is just mad. So, of course, when he comes up again, they hit him. He gets on base, steals second, steals third and then spits on them." Butler laughs. "That's him, in a nutshell." That's probably enough to get you excited about him but there is a lot more to him than just gumption and speed. Eaton has power that seems to defy the realities of his 5'8 body. He hits for average. In the minors he hit over .300 at every level and usually well over that mark. His on-base percentages have been over .400, usually well over that mark. If he receives the regular at-bats he is due, 30-40 stolen bases are also quite likely. Larry Schechter's new book has the fantasy industry extremely excited. He is not your typical fantasy expert. You can check out his website for all the praise for his new book and my review of the book (which I loved) is here. I've read that you first discovered fantasy baseball through a magazine article. What was the very first fantasy league you played in and how did you do? Do you still play in a local league? Not correct. I first heard an ad on the radio when living in Boston for a company called the "World of Sports." It sounded interesting and I joined. It was just one guy who started a company to run leagues. We had the draft by a conference call (back then, it was the only way to do it if you couldn't be in person). I don't remember how I did in that league. I've never played in a local league. The first time I did an auction/draft in person was when I joined LABR and then later Tout Wars. Being in those leagues I think must be fairly similar to a local league, because I see a lot of the same guys every year at the auctions and many of us talk via e-mail, twitter, etc. Was becoming a member of Tout Wars a goal of yours or just a by-product of doing so well in the national competitions? Did you ever actually plan to become an industry expert? When I won CDM in 2002, they had a deal with LABR that part of the prize for winning CDM was to play in LABR the next year. I was very happy to get a chance to do that. It was only a one-year prize, so after 2003 I was no longer in LABR. But after getting a taste of it, I wanted to get back in, and was able to work out a deal with Dennis Lepore of the Sandlot Shrink. I did a little writing and advice stuff for the Sandlot Shrink, and represented them in one of their LABR leagues. When I also got an invitation to play in Tout Wars, that was a nice surprise. 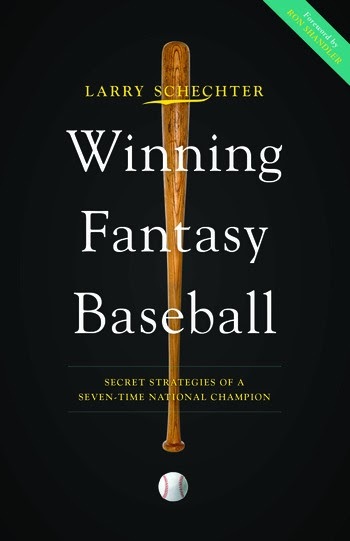 Your book - Winning Fantasy Baseball - has been a huge hit in the industry so far. How are you planning to build on that success? Do you have another book in you or perhaps a more traditional sort of fantasy guide? I don't have any plans, but it's possible I might write a second baseball book or a football book some day. I have no desire to get into a fantasy guide, web site, player projections or anything like that. What was the easiest portion of your book to write? Why? There were a lot of different parts that were pretty easy to write, once I could get myself to sit down and actually do it. But overall it was a lot of work...and then a lot of work to re-write and edit. There was a point where I had about 100,000 words and was on track to have about 150,000 total, which I realized was way too long. I had a bit of a breakthrough when I was able to look at everything I'd written in a different light and started cutting out all kinds of unnecessary and redundant stuff, and I got the final manuscript down to about 95,000 words. What was the most difficult portion? Why? The value formula, because it's so confusing a topic. I think that I did a good job of summarizing it all and making it as simple as possible for people to understand. When you walk into draft room, what do you absolutely always have? Does it vary much by draft-type? Have you ever tried using a computer during a live draft? The only thing I've ever used a computer for is to add up the stats of the players I draft and keep a running total, because it's a little easier than doing it by hand. But I rarely bother with a computer, because of space limitations. I'd rather use the space to spread out my player sheets. I get the feeling you're a fan of Jacoby Ellsbury. How do you think he'll do in New York? Do you tend to avoid players in their first season with a new team? I was a fan. Now that he's with the Yankees, not as much (because I'm a die-hard Red Sox fan). I'm not mad at him or calling him a traitor, like some Red Sox fans, but for anyone who is mad, I've got a nickname to suggest--along the lines of that other traitor, Johnny Demon. I would call him Jacoby Can-Go-to Hellsbury. He should do great in NY, if he can stay healthy. That's always going to be the concern with him, unless he can string together several years of 150+ games. I wouldn't avoid, nor would I target, someone switching teams. The Red Sox seem determined to go forward with Jackie Bradley Jr., Xander Bogaerts, Wil Middlebrooks. Are you a fan of the youth movement in Boston? Do you follow the minors much? As a fan, I wish they'd re-signed Ellsbury or gotten Beltran or Choo. I'm not sure Jackie Bradley is ready. But after last year, I'm not going to complain or question anything they do. Last opening day, I was quite sure they wouldn't win 81 games. I was very impressed with Bogaerts plate discipline, especially against Detroit in the playoffs. When everyone else was striking out, he was taking close pitches. I think he's going to be good...but how good and how fast, I don't know. I'm guessing Middlebrooks is going to be okay, but he's not a sure thing. I was surprised, and disappointed by how much he struggled last year (I owned him on a couple of teams). I've managed to interview a few Touts (Lenny Melnick and Cory Schwartz) and I always ask the same question? Do you have the juice to get me an invite? Nope, all I can do is put in a good word for you. Are you enjoying our New Years Nor'easter? Can you get the kids to shovel your snow? I'm enjoying it more than the people who are going to be at the 49ers-Packers game this weekend in sub-zero weather. It's a nice, toasty 72 degrees in my house. I can barely get the kids to take out the garbage or wash a couple of dishes...shoveling is not going to happen. But my driveway is really, really long, so I need a plow, anyway.